I've been thinking about my route to school from Arlington and ways I can either a) make it faster, b) make it safer, or ideally, c) both. Let's say my starting point is 1465 Massachusetts Ave in Arlington. Usually what I do is go straight down Mass Ave all the way to St Stephen St (just before Huntington Ave), and cut through part of Northeastern and then a short section of Huntington Ave until I get to Wentworth. Sometimes I take the Minuteman path to Alewife, then the "Alewife Linear Path" (as it's called on Google Maps), merge onto Mass Ave and continue as usual from there. 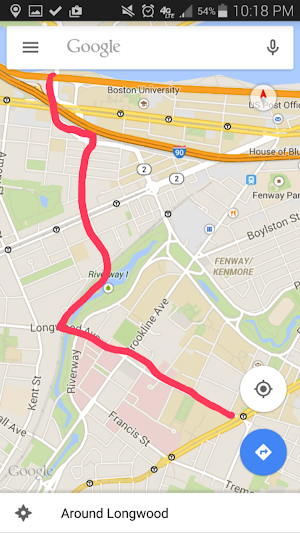 I have considered taking a right onto Beacon St right after the bridge, going straight until Superb Bicycle, then left onto Miner St and going from there, but I haven't actually done it. I'm sure there's a better way out there, does anyone have any suggestions or thoughts on the three routes above? 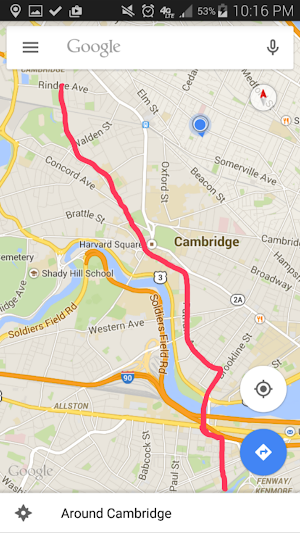 I would take the Minuteman to Alewife, as you do, then you can go through Huron Village* or so to get to the river round about the area of the JFK school. Cambridge (Mem. Dr.) side has the advantage that you can get on to Mass ave at the bridge. I'd take a block or so down Beacon, then go left (sout/east?) and take the Fens to Wentworth area. You can a avoid a lot of car-space that way. *Huron village has some really nice back roads & even one small hill, if you feel like incorporating a wee tiny extra workout into your commute. I won't even make suggestions - just explore. If the minute man is in rough shape, or i just felt like it that day I'd take mass ave to Putnam. That continuation onto Essex is awesome, though as of last week a little tight due to snow. Also you have to make sure you point out where you're going cause people assume you're turning right and will pull out in front of you. That was part of my commute for a few years. You guys are awesome. I just had the best ride in. I took mass ave to Putnam because the minuteman is rough and then went straight down Essex (I see what you mean by having to signal after the bridge to go straight). After all this snow melts and the roads widen up, it'll be even better. Thanks to everyone. yeah in hind sight that slight variation to essex in probably an improvement. Honestly I change my route out of mood, or boredom, or traffic, or even sometimes just if someone is in my way so I'd advise never to be steadfast about any one route.